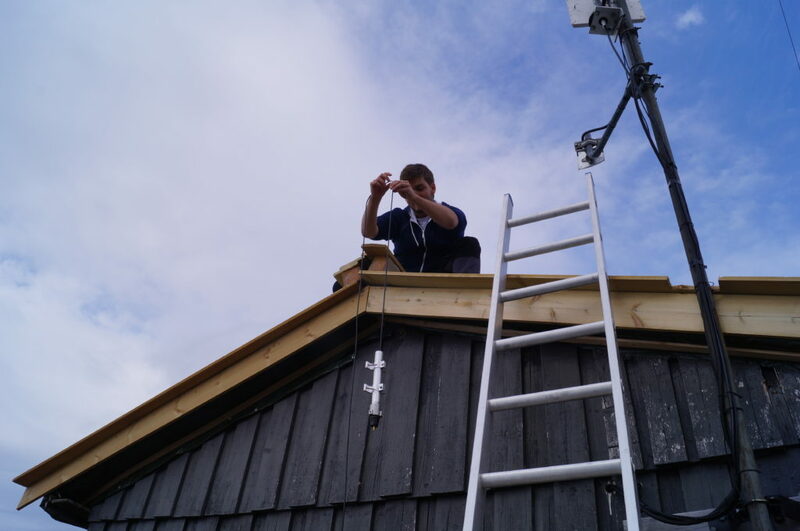 This weekend we put up a Automatic Identification System (AIS) receiver while making some improvements on our internet link to Vassfjellet. 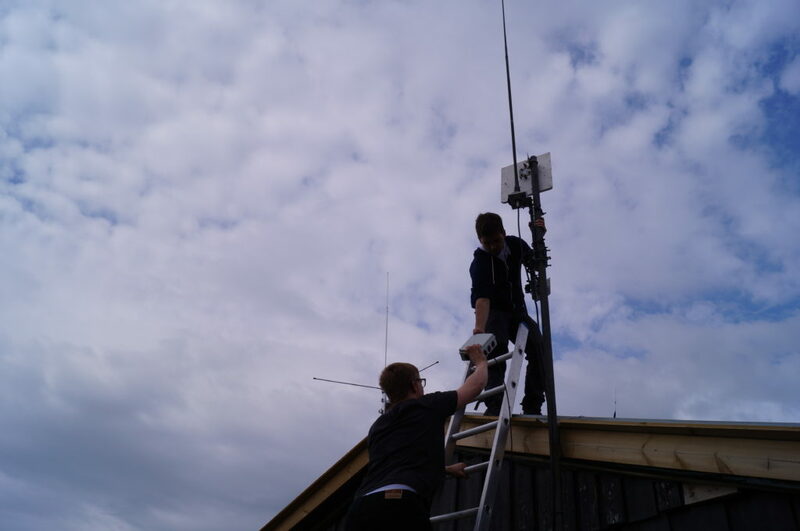 Last year we installed a 5.8 GHz radio link between Samfundet and Vassfjellet, where we have our radio beacons. The radio link will allow us to remotely check status of the beacons, and allow for several exciting monitoring applications. 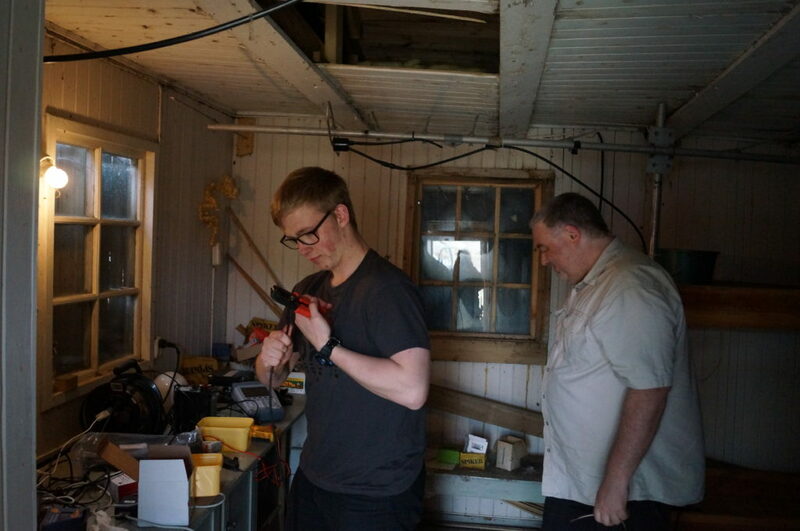 We found out that we had done a mistake in choosing the feedline between the Ubiquity rocket M5 and the antenna. The mistake has nagged us over the entire winter, so when the snow on the road finally melted, we bolted up the mountain. LB0VG terminating RJ45 plugs for the link. LA1BFA inspecting important assets in the background. The feedline was around 6-7 meters of a RG-58 type. At 5.8 GHz this turns out to have a massive attenuation, approximately 13 dB. By simply replacing with a shorter and better cable, we could get a huge improvement in link quality. To get as low cable loss as possible we decided to mount the Rocket right behind the antenna. We bought some 15 cm RP-SMA to SMA pigtails that use RG174 cable, which should give a cable loss of only 0.56 dB. The resulting improvement is seen below. 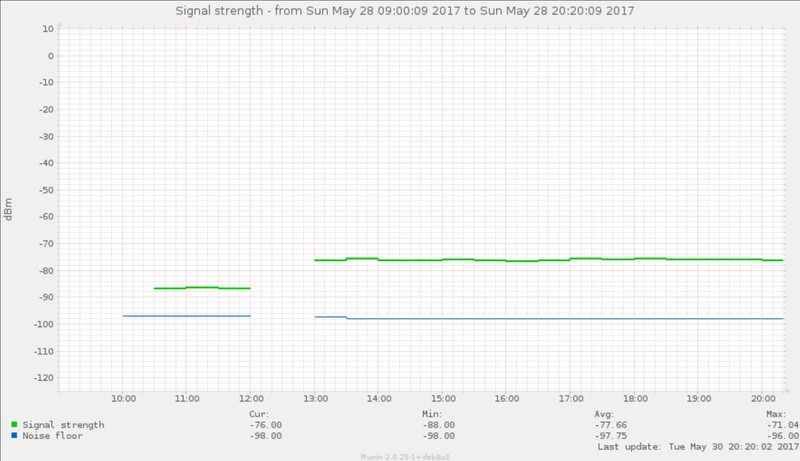 When we took the link down at 12.00 UTC the link margin was 10 dB. We had it up again an hour later, and the link margin is now 22 dB. This is very much in line with the cable loss improvement mentioned above. This improvement in link margin will be very nice when we start adding more services up there. Boats over a certain size are required to report their position using AIS. This makes for very interesting listening, as you can effectively stalk the movements of large boats. We tuned the antenna to 162 MHz using our AA-170 antenna analyzer, and got it to resonate with about 1.2 VSWR. The antenna was plugged to the SLR350Ni, which surprisingly is based on a Raspberry Pi 3 with a radio daughterboard. After a small power struggle with the software and trying to set it to a static IP, we started receiving ships. We were a little worried about the receiver getting a lot of interference from LA2VHF, as they are in the same band, and very close. But it looks like everything is working smoothly. LB0VG handing LA3WUA the Rocket modem. Behind LB0VGs head is the newly installed AIS antenna. Below is a display of the ships that we have received. On average we get 200 AIS messages a minute from about 100 ships, with a maixmum reception distance of 463 km. I’m confident that by adding some filtering, an LNA and maybe a small yagi antenna, we can get more than double of this. You can also find live information on our Marinetraffic station page. 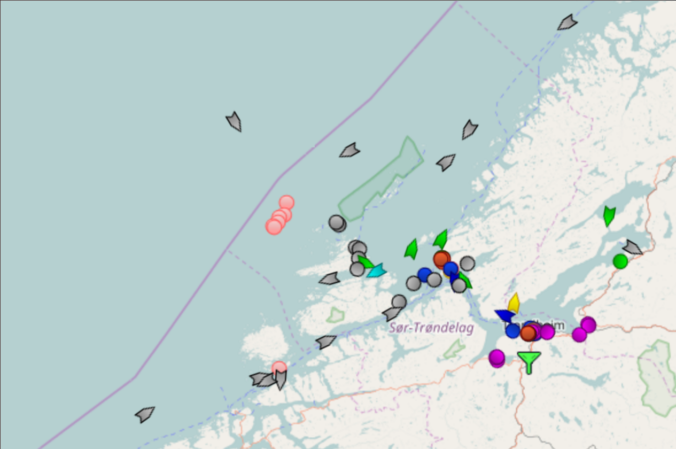 AIS messages from boats near the Trondheim coastline. Vassfjellet receiving station in lower right. It’s very nice to finally get some traffic over the link. Over summer we’re hoping to expand with more monitoring services, but that’s a story for another blogpost. LA3WUA demonstrating a patented LA1K antenna hoisting method.